A modified Faraday rotation method is developed using a nanocell filled with cesium vapor. Formed atomic lines have a spectral width 1.5–2 times narrower than those obtained by the Faraday rotation method. In magnetic fields of B = 5000–7000 G, all the atomic transitions of the Cs D2 lines, formed in the spectra, are spectrally resolved and identified. In particular, transitions that are forbidden at B = 0 G have been investigated, however, at certain values of the magnetic field, there is a gigantic increase in their probabilities. It is shown that the modified Faraday rotation method is convenient and efficient for high-resolution spectroscopy for Cs atoms. There is а good agreement between the experimental results and calculated values. The practical applications are also noted. 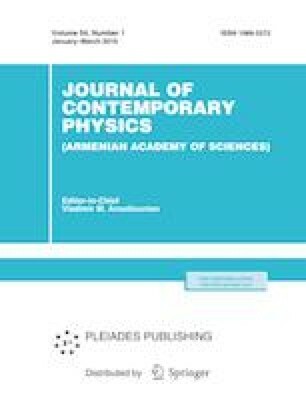 Russian Text © A. Sargsyan, A. Tonoyan, G. Hakhumyan, A. Amiryan, P. Todorov, S. Cartaleva, D. Sarkisyan, 2019, published in Izvestiya Natsional'noi Akademii Nauk Armenii, Fizika, 2019, Vol. 54, No. 1, pp. 110–127.